You can listen our new album on the Black Metal Promotion YouTube channel ! Notre nouvel album en écoute intégrale sur la chaine YouTube de Black Metal Promotion ! 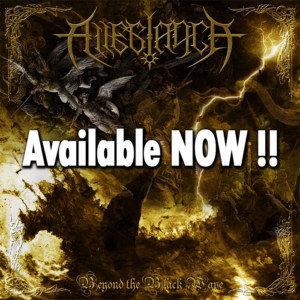 Our new album « Beyond the Black Wave » is officially released, you can buy and download it on our BandCamp page now ! You will also be able to download the booklet in PDF format. Note: due to personal reasons, we had to delay the release of the limited CD digipack of the album. We will work hard to release it as soon as possible, and you will have some news about it soon. Thanks for your understanding and your support ! 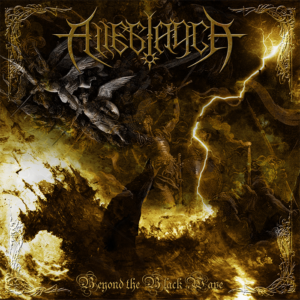 Notre nouvel album « Beyond The Black Wave » sort officiellement aujourd’hui. Vous pouvez l’acheter et le télécharger sur notre page Bandcamp dès maintenant ! Vous pourrez aussi télécharger le livret en format PDF. Note: en raison d’évènements personnels, nous avons dû retarder la sortie du CD Digipack limité de l’album. Nous travaillons dur pour le sortir dès que possible, et nous vous donnerons des nouvelles bientôt à ce sujet. Merci pour votre compréhension et pour votre support ! We are proud to announce that our 1st full-length album « Beyond The Black Wave » will finally be released (first only in digital format via Bandcamp) on the 1st of october 2018 !! You can listen now to one of these new tracks: « Fall of Black Heroes » !! With Strength you will burn !! Yesterday’s show was amazing. 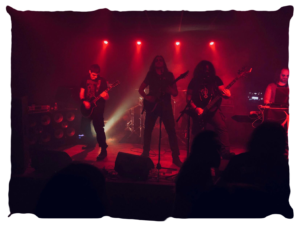 Thanks to L’Usine à Musique, Blindherd, Smashed, Catacombed and us we were able to offer our audience good shows. Stay tuned, for more infos to come. 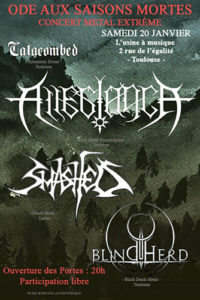 We are to share the stage with Smashed, Blindherd and Catacombed on January the 20th in Toulouse at L’Usine à Musique. Since our last announcement in June this year, many things have happened. It is with grief that Bér and Allegiance part ways. We wish him good fortune for the events to come with I HEIR I and all the best for the private part of his life. Time to tell you that reinforcement has appeared: Haeretic is now fully part of the band and be sure that Allegiance will be at its full potential for what is coming next. As you can see, we have a website and we hope you find it pleasant. Here are all the information about us. The History section presents Allegiance and ourselves, the hands to serve. Discography section presents, of course, all of our releases. In Media section, you will be able to see photos, whether it will be the ones for promotion or the ones from the gigs. And, who knows, maybe some misc stuff. You can contact us in the section of the same name, and you can download our EPK (English+French versions). Finally, the Merch section is where to buy our CDs, Clothes, etc etc… By the way, all orders shall be made manually, check the page « how to order » on our webshop for more details. Please, note that we will do our best to keep the website updated, but some mistakes may occur, so if you detect a bug or something suspicious, please, send us a message about it.